Fresh off their 6 nominations at this year’s NZ Music Awards SWIDT announce their debut Australian tour to launch their new album “Stoneyhunga”. Onehunga’s very own SWIDT also known as The Most Electrifying Rap Group in Entertainment have had New Zealand in a frenzy over the last 2 years. In such a short amount of time they have managed to command the attention of everyone with their flair, raw lyricism, hard hitting production & their electrifying onstage presence. SWIDT which stands for ‘See What I Did There’ is a five-man collective which is comprised of producer SmokeyGotBeatz (producer credits for TDE / HS87), rap duo SPYCC & INF and SWIDT in-house producers JAMAL and Boomer-Tha-GOD. They broke onto the music scene with their independently produced single & video “No More Parties in Onehunga” in early 2016 & from there the momentum built with the release of SmokeyGotBeatz debut album ‘SWIDT vs EVERYBODY’. These garnered nominations for the prestigious “Critic’s Choice Award” and winning the “Best Urban/Hip Hop” Album of the year at VNZMA. SWIDT’s song 312 also featured in the film ‘Pork Pie’. 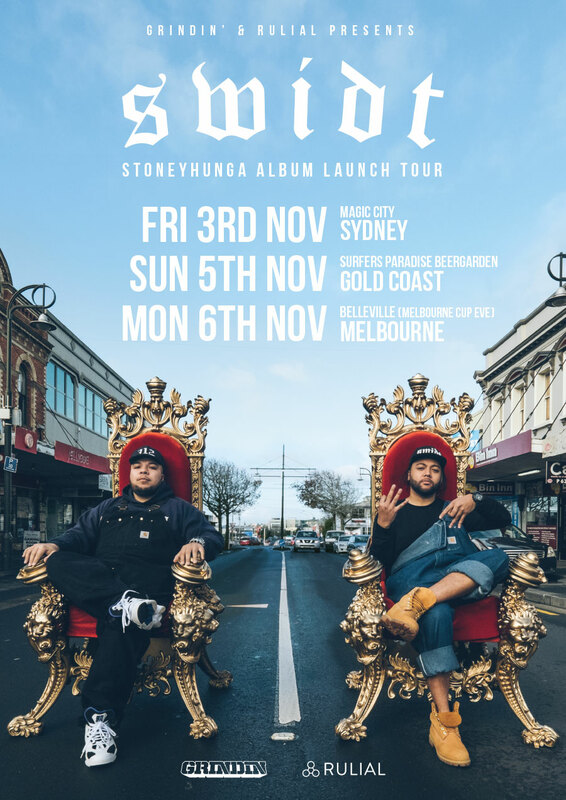 On July 28th the Onehunga natives SWIDT released their debut album ‘STONEYHUNGA’ which locally debuted at no.1 on both the iTunes Hip Hop charts & the iTunes Pop charts. They also got no.3 on the Rianz NZ albums chart & no.4 on the Rianz albums chart. Being the innovators they are they put on a week long pop-up store/exhibition providing fans with a location to purchase STONEYHUNGA hard copies, merchandise, a photo exhibition of Onehunga rap lineage & a number of different activities throughout the different days. Off the back of their 6 VNZMA nominations this year they plan take that Stoneyhunga flair to Australia for a tour.